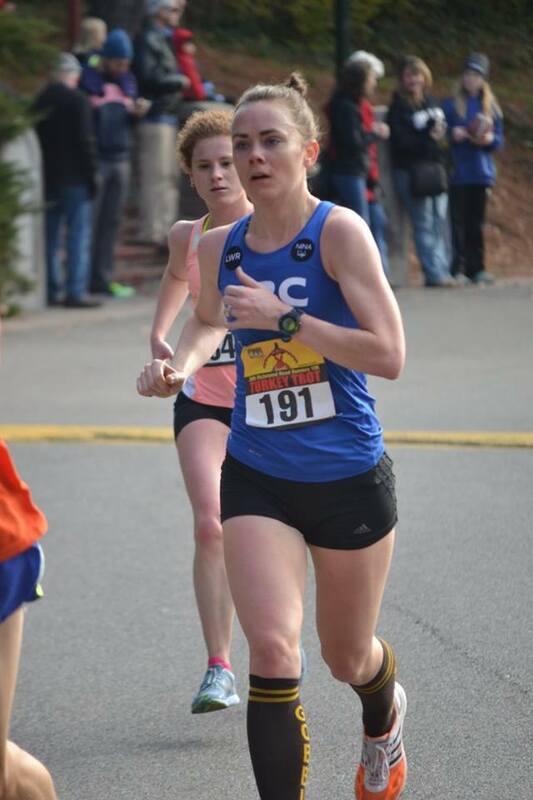 An unexpected holiday savings for you: two race reports for the price of one! 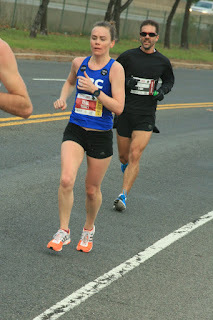 Two weeks ago, I ran the Philadelphia Half Marathon. I knew I wasn’t in shape to PR, but I was excited to get back into the world of racing and see what I could do. 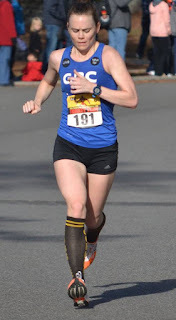 Four days later, I ran a Turkey Trot 10K. 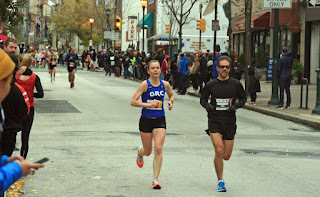 Again, I knew it wouldn’t be a PR, but I love holiday-themed races, and it’s hard to turn down a Turkey Trot. The Philadelphia Half Marathon, mile 6. At the half, I just tried to run by feel and see what happened. I hoped to start on the slower side, but the first mile was a bit fast and then the second mile marker was way off. (Thanks to the runner near me who warned us not to freak out over the ridiculously slow split!) By mile three, I realized I was staying pretty steady and feeling comfortable. Awesome. I still felt great for the next couple miles and I had approximately 8,500 friends and family members out cheering. Mile 6 was a major cheer zone and basically every block someone was screaming my name. (Everyone’s name was on their bibs, so that also helped.) I remember thinking that this is what L.A. will be like; I have a ridiculous amount of people coming to support me there, and on a looped course, it seems like I’ll have people cheering for me every quarter mile. L.A.’s going to be even crazier than this, and this is nuts. By mile 7, the crowds thinned and the hills started. At every mile I thought, Well, that mile had some uphill. Don’t look at the time; it will be discouraging. So I just ignored my watch and ran by feel. Keep the effort steady. The wind was another force of discouragement. Along the river, the mile three marker had blown over and onto the runner in front of me. Weaving through the city, the buildings would block the wind momentarily, but then at each intersection it would come barreling back at you. After mile 7 or so, as we headed out of downtown, it seemed to get worse, or maybe I was just tired of it. I tried to draft off people, but I am really terrible at drafting. I know! I’ll use this opportunity as practice! Here we go, tuck in behind this guy… Wait, that’s not helping. Maybe at this angle? No… It wasn’t a very successful mission in that regard, and every so often I gave up to focus again on just running my own pace. By mile 9, I realized I had slowed considerably. But just as I felt like I was getting my rhythm back, the last hill hit. And I fell apart. The pace pack going for the Trials standard caught me; I could hear the many footsteps of the swarm coming and then the pace leader encouraging them up and over the hill. Remember the awesome time I had a pacer? Maybe I could borrow some encouragement from this one. I can at least draft in a pack! I tried to tuck in. But they swallowed me up and spit me out instantly. And then the demons started talking. These women were running twice as far as me, at a pace I used to be able to sustain. (In what seemed like another lifetime.) Yeah, yeah, yeah, I know I’m not in shape yet, whatever. It was a world of discouragement anyway. Maybe I’m not as fast as I think… My mile ten split was ridiculously slow, eerily close to the way-too-long mile two split. In the last mile, a girl nearby tried to encourage me to run it in with her, “Let’s finish this thing!” I couldn’t. All of me tightened up simultaneously. I felt like I was trying to run the day after a marathon, all stiffness and Tin Man-like joints. I wanted to sprint it in, to prove that I could run fast, even if just for a closing spurt, but I barely managed much of anything. I finished in 1:21:49. The time is faster than the half marathons I opened the last two seasons with, so it seems like I’m starting in a good place. That’s encouraging. But I was also pretty disappointed with the middle miles. I feel like I lost a bit of the toughness that racing requires and I just gave up on myself. I think that’s part of the point of these early races though, to get that reminder, to build back up the racing muscle. Lesson learned, right? Wrong. 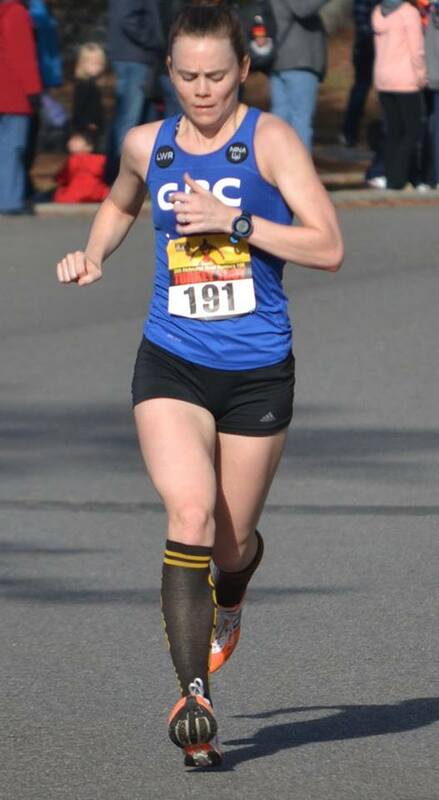 Four days later I ran a Turkey Trot at the University of Richmond, my alma mater. I knew four days was not enough recovery time, but I had called Sunday’s half a “hard workout” so that’s what this would be, too. I had run the course a couple years ago and knew it was crazy hilly so I wasn’t going to worry about my time. But I had finished second back then, and this year, I wanted to win. I thought it was possible, even despite the quick turnaround and the taking-it-as-a-hard-workout approach. It wasn’t a ridiculous thought, for about 5.5 miles of the 6.2 mile race, I was winning. Early on, with my pursuer just behind. At a turnaround at mile 5, I had the chance to confirm her proximity. I tried to pick it up, but on the last uphill around mile 5.5 she caught and passed me. Just after the top of the hill, I caught back up to her and we ran side by side down towards the finish. I thought I could sense her faltering or getting tired (I think I can outsprint her…), but just past the six-mile mark she took off and I was left outsprinted. She crushed me in those last few meters; I had nothing. my stupid legs to MOVE. And I was way more upset than I thought I would be. I wasn’t supposed to have had expectations for this race, I had just had a hard workout, this was a fun holiday jaunt, blah blah blah. Instead I was super bummed I lost the way I did, right at the stinking end. It was another race where I really wished I could re-run it and find some extra gear or motivation. And the time was disappointing, too. I knew better than to expect a fast time, but it wasn’t too much faster than what I had run there three years ago, and I’ve come a long way as a runner since then. But I didn’t show it. In the end, I’m sure I got what I needed physically: two hard workouts to help get me back into shape. Psychologically they were tough, but that was important practice, too—to remember how to race, to not give up, to find another gear at the end. There’s more to do to build back up my racing grit, but I’m working on it.